I have been adding texture by gluing stuff onto Hazel's house using my hot glue gun. I got a nasty little burn. -NOT from the glue gun, but from COOKING!!! I can handle a glue gun and a jigsaw, I just cannot handle a saucepan lid. Stupid thing just flipped in my hand and bit me. I made an interesting mess with the styrofoam and I have also enjoyed sculpting with foil. Wow, Sam! You have been in the creating zone and it's looking positively intriguing! 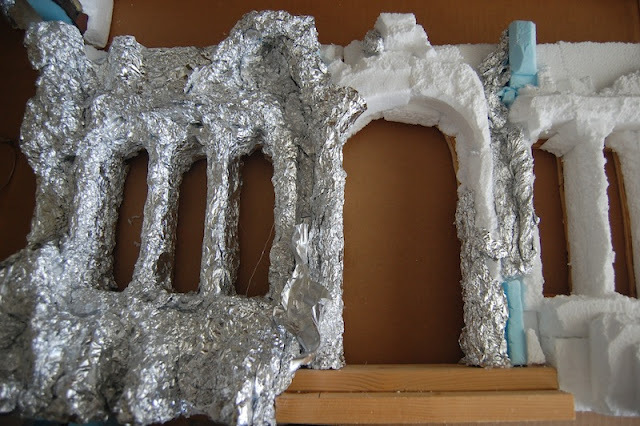 I am excited to see how you cover the foam and foil! Thanks Jodi. Yep, I need to get that petition going! That is looking gorgeous. Once again I have to say the foil technique is terrific. I cannot wait to see more. Ooh ouch! What a bugger of a place to get a burn Sam, bet you swore. Thanks. I do hope it will be perfect. I am trying to utilize all the craft stuff we have hanging around. Thanks Birgit. Hmmm, hazard pay...I like that idea! This house is looking really intriguing. I'm really liking the shapes you are making. It's got an almost Art Deco feel about it. Looking forward to following along.